Make This Handmade Dragonfly Card On Your Computer! Here's a handmade dragonfly card that I made with the help of my computer using royalty free graphic. It's is quite easy but will need detail embossing powder, a heat gun and a piece of acetate or clear transparency. Make sure that the transparency is one that can withstand heat. Here, I use eyelets to attach the transparency to the card front. Try it! It's fun! And whoever receives it will love and treasure it. Use a computer image editing software like Adobe Photoshop or Paint Shop to enlarge or reduce dragonfly graphic to right size. 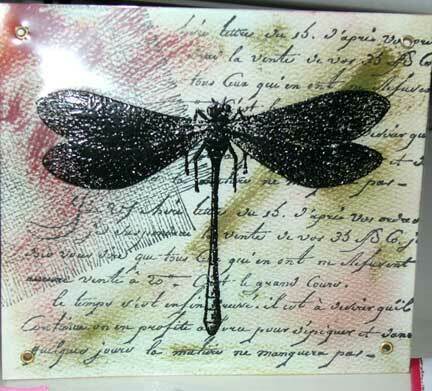 Print out dragonfly image onto acetate. Quickly pour embossing powder onto the image covering it. Shake off excess powder and clean up stray powder with a tiny brush. Heat emboss the image with a heat gun or heat source. Ink netted background rubber stamp with black ink and stamp on top right corner of white card front. Ink Old French Writing background rubber stamp with black ink and stamp onto front of white card. Using colors of your choice, dab inkpads directly onto card. Trim acetate to the same size as white card front, positioning the dragonfly in the centre. Punch holes and use eyelets to attach to the card front. That's it! Sorry that the photograph above did not do justice to this handmade greeting card. But the real card is definitely nicer to behold and the recipient should be pleased to receive. Try making this fun card with other royalty-free images which you should be able to easily find online. What about butterfly, flower or geometric shape outlines? Just download and print and quickly embossed with detailed embossing powder on acetate or transparency and mount on decorated card front. Yes! My mistake for not using detailed powder. I found that using detailed embossing powder will help brings out every detail of the image. The above card wasn't done with detailed embossing powder so the image of the dragonfly doesn't stand out sharp and crisp.